Friday Wrap-Up – News from NB HopSpiel, Shiretown, Rockbottom, Petit Sault, Propeller, Sea Level, and more! • Back in September, we alluded to NB HopSpiel, another beer event coming up early next year in Fredericton, from the creators of the Fredericton Craft Beer Festival. Well, we now have more details! An outdoor curling tournament featuring a beer garden, it will be held Feb. 6th & 7th, during the annual FROSTival winter festival. Held downtown in Officer’s Square, you’ll need to register in teams of four to participate. Friday night will feature an “Introduction to Outdoor Curling” from 6:00 – 8:00 pm, giving the opportunity to practice your skills and meet fellow curlers. On Saturday, the tournament will begin at 8:00 am and continue until the closing ceremonies at 4:30 pm; each team will play a minimum of two games. Of course, the beer garden will be there throughout the day (and will stay open until 8:00 pm), featuring NB craft beer, cider and mead from 5-6 breweries, with approximately 10 different products. Every contestant will receive beer tickets, with more available for purchase. There will also be other contests through the day, including “Best Dressed Team” and “Classic Snowsuit Contest”. What about food? Luckily, they will also be hosting the Fredericton Chili Challenge that day! Tickets will be approximately $65 each ($260 per team), and will go on sale December 1st; you can pre-register and hold your spot now, online. Stay tuned for more info as it becomes available! • Shiretown has yet another new one-off beer available for growler fills at the brewery. A first impression of the name – Venezuelan Express Porter – would make you think “coffee”, but it actually refers to a type of crude oil produced in Venezuela at the time, that used to come into Dalhousie for the now-closed Dalhousie Generating Station, according to owner/brewer Derek Leslie. A dark beer that comes in at 5% ABV and 25 IBUs, it is brewed with an unidentified hop variety harvested from Letourneau Lane in Dalhousie that is thought to have been growing there for over a hundred years. You can also currently find the beer on tap at the King Street Ale House in Fredericton, for a very limited time only! • Rockbottom Brewpub is looking for a head brewer. 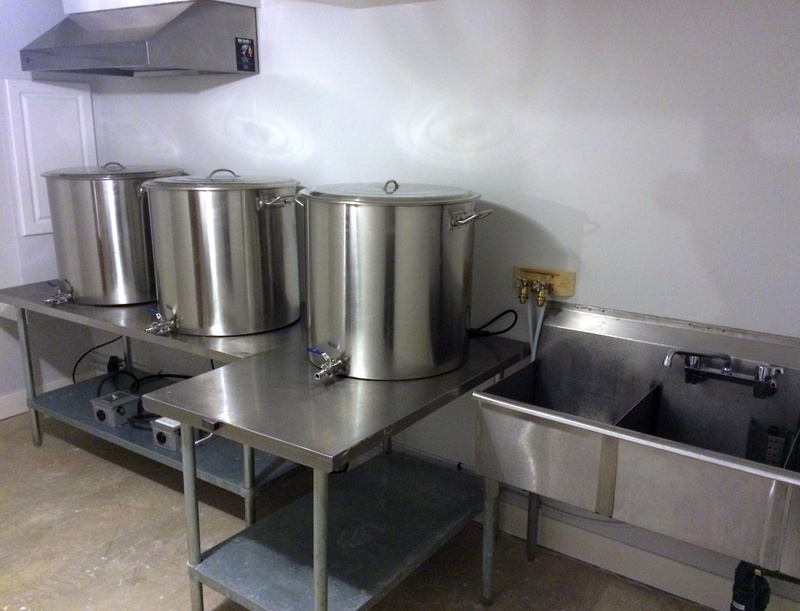 The very busy brewpub on Spring Garden Rd in Halifax has put out the call for a brewer with previous experience to step in and brew on their 8 bbl Electric-fired DME system. In addition to once-to-twice weekly brews, the successful candidate will be responsible for quality control, ingredient inventory and ordering, and staff training, and will be an all-around, one-person army in the brewhouse. They are looking to hire someone immediately, to train with current Brewmaster Greg Nash. Interested candidates should email a cover letter and resume. And in case you were worried, dear reader, that Mr. Nash was getting out of the brewing business, or leaving our region, fear not! He is leaving to open, with partner Andrew Murphy, a new brewery in Halifax’s North End, named Unfiltered. • The Amber Ale recently brewed by Brasseurs du Petit-Sault is now available. Named Louis XVII, it’s available for growler fills at the brewery now, and is also on tap at Frank’s Bar & Grill; it should also follow at Resto-Bar le Deck by this weekend, and hopefully in bottles by early 2015. And if you’re attending the Fredericton Poutine Festival tomorrow, it’ll be pouring there as well! • Good news everyone! Propeller Brewing’s One-Hit Wonders are back! These one-off, draft and growler-only brews, come out of the Gottingen St location when space and timing allows. Today’s launch is Section 31 Pale Ale. Unfortunately, we don’t have any other information on the beer for today. In other Propeller news, be sure to read the article from Chronicle-Herald this week for some insight into the start of the brewery through founder/owner John Allen. • Sea Level Brewing in Port Williams, NS marked the return of two darker brews this week: Crossing Muddy Waters Brown Ale and Port in the Storm Porter. The Brown Ale is a North American style, weighing in at 5.5% ABV, featuring chocolate malt profile with subtle hopping. The Porter features coffee and chocolate flavour and aroma, weighing in at 5% ABV, using English hops to balance the malt. Look for both beers on tap at the Port Pub and around the Valley and HRM, and growlers and cans at the brewery, and cans at the four private stores in HRM. • Uncle Leo’s Brewery has a new seasonal beer that they recently brewed, a Sweet Stout (aka Cream Stout, or Milk Stout) named Uncle Leo’s Cream Stout. A delicious beer style that is brewed with lactose powder to provide a slight sweetness, and fuller body, it has an ABV of 5%, and 23 IBUs. Look for it to be released for growler fills at the brewery by next weekend; they’ll be brewing the beer until the end of December. Fans of their award-winning Vohs Weizenbier have no need to worry – it will return in May, 2015! • As a follow-up to yesterday’s profile on TrailWay Brewing in Fredericton, they announced this morning that they have passed their inspections, and will be brewing their first test batch on their new brew system today! Congrats on the completion of one more step, Dan and Jake! • It’s about four months away, but that doesn’t mean it’s too early to start getting excited about the 2015 Fredericton Craft Beer Festival! Tickets for the March 7th event will officially go on sale on Friday, November 28th at 10:00 am – the link should be on their Facebook page soon. Keep in mind that VIP tickets for last year’s event sold out in less than three hours, so remember this date! And keep an eye on their Facebook page and Twitter account close to ticket launch – they’ll be holding a contest to win two VIP tickets to the event. • And speaking of the FCBF, they’re holding their third Burgers n’ Beer event later this month, on Thursday, Nov. 27th at 8:00 pm. While the brewery list has not yet been announced, it should be a tasty time (come on, just look at the title) as usual! As a switch, this time they’ll be offering ten different 4 oz beer samples, as opposed to their regular five 8 oz samples, paired with five reLiSH sliders. Tickets are available now; they’re $45 and available through the link above. As an added bonus, if you attend, you’ll have the chance to buy FCBF tickets a day early, with a 10% discount! As for this weekend, want to get the first taste of Garrison Brewing’s Klingon Warnog Roggen Dunkel Ale? It is being released today at 3:30 at the brewery, and all sci-fi and beer fans are welcome! In case you can’t make it, it will be available at the brewery, all four private stores, and a limited number of bars and restaurants in HRM. If you are in Moncton, Fredericton, or Saint John, be sure to check out your local ANBL to see what’s pouring from the growler taps. In addition to some interesting beer from away (Brooklyn East India Pale Ale is pouring in both Dieppe and Saint John), local favourites Big Axe Shakesbeer Chocolate Oatmeal Stout and Picaroons Winter Warmer (Fredericton), and Pump House Pail Ale (Dieppe) are pouring. They will fill any 1.89 L growler, so you needn’t buy one of theirs (just be sure yours is clean, as they do not have the facilities there). And maybe we’ll see you at Fredericton Poutine Fest tomorrow night! ACBB: Tell us a little about your homebrewing history. Dan: For me, my dad has homebrewed for almost 30 years and I have always been interested in the hobby and the beer he was making. Eventually I became interested in brewing better beer and beer of different styles, and the rest is history. I started with a couple of kits and immediately made the jump to all-grain, and since then I have probably brewed 3-4 batches per month. Jake: I got into making beer in my second year of University. I started buying the cheapest kits I could find and soon realized that the quality of product had a huge impact on the final product. I first got into brewing when I realized that I could make it for a lot cheaper than I could buy it for – likely my cheap accountant side coming out. I eventually was introduced to a couple of the original members of the New Brunswick Craft Brewing Association (NBCBA) and had the chance to try their all-grain beer. I immediately started stockpiling all-grain equipment and the hobby soon became an obsession. What made you decide to take the step into brewing professionally? Dan: One of my favorite parts of making beer is sharing it with friends and family. Sharing my beer on a larger scale gets me very excited. Jake: Similar to Dan, I consume a small percentage of the product I produce. I really enjoy giving it away – and the more of it you can give away, the more 5 gallon batches I can brew! I’m a Chartered Accountant but I always thought it would be cool to do this professionally on the side. A couple months back, Dan and I were sitting in my kitchen during one of our club meetings, and we began talking about how fun it would be to start a small craft brewery. My problem and main stumbling block was time – during the busy season at work I simply do not have enough. Dan’s main holdback was more of a space issue. I was just finishing up building a new house with loads of space in the basement. The partnership made a lot of sense in these respects. That day, we brainstormed the idea and here we are now. What steps have you taken so far getting everything up and running? Nearly all brewing equipment has been purchased and is on-site. 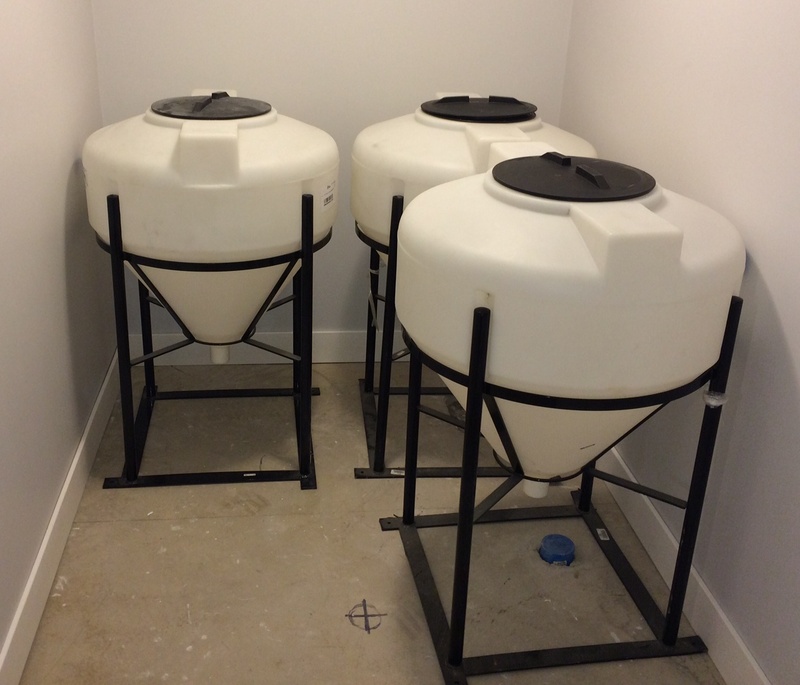 Brewery construction is nearing the end and we should be licensed in the coming weeks. Do you have any other partners in the brewery? At this point it is just the two of us involved in the brewery. What size/type of system will you be brewing on? We are starting with a one barrel (31 U.S. gallons, or 116 L) electric brewing system. We’ve pieced it together from various suppliers & manufacturers. Do you know when your beers will be available to the public? Timelines can – and most likely will – change, but at this point we are targeting mid to late December. Our first inspection is scheduled for today, and we plan to have everything construction/equipment-wise ready for then. The timeline will largely depend on the timeliness of licencing agencies. What are your plans for distribution? Plans for tap accounts, bottles, growlers, etc.? Initially we will be selling kegs for distribution to pubs and restaurants. Do you have any beer bars/restaurants in the area lined up to serve your beers? We’ve spoken to two popular restaurants in town who have both shown a keen interest, but nothing has been officially set in stone. We’ve only spoken to these two restaurants and want to start with only two or three accounts so that we can gauge the demand – if we have the capacity, we’ll consider expanding our distribution to additional restaurants or pubs. Can you tell me about the beer(s) you plan on offering initially? Are you planning on offering a specific style, or genres (German, English, etc. ), of beer? Any seasonals, one-offs, or will you stick mainly with a “flagship lineup”? We both tend to brew a lot of beers featuring American hops, but we also both love to experiment with different ingredients. We will focus on full-flavoured ales. Where we’re both homebrewers at heart, we love the idea of experimentation and producing a lot of one-off beers. Have you had any assistance from other breweries/people in Atlantic Canada (or elsewhere)? We’ve received various help from our friends at Grimross, Sunset Heights Meadery (with both breweries being owned by members of the NBCBA) and Picaroons. With the recent increase in the number of new breweries in Atlantic Canada, what will make TrailWay different from the rest? As mentioned, we both love to experiment with ingredients and TrailWay Brewing Co. will very much be about experimentation and playing with new recipes. Where do you hope to see TrailWay in the next 2-3 years? It’s difficult to say. We would both love to see TrailWay grow and continue to focus on these experimental batches and possibly have a tasting room at some point. We’re going to continue brewing on a part-time basis and if there’s a business case to expand operations, we’ll cross that bridge when we get to it. Do either of you personally have a favorite beer style? Beer? Brewery? Our flavours are similar. We both love pale ales, IPAs and stouts of all kinds, although any beer with a lot of flavor is a winner in our books. Did we mention that we’re both hop-heads? Do you have a specific ingredient in brewing that you like to brew with? E.g. a specific malt and/or hop variety? So far we would have to say any American hops. We are big on the intense aromas and flavors they bring. Expect to see a lot of late hop additions to produce this big hop aroma and flavor – we won’t be shy with dry hopping either. From what/where/whom have you learned the most in respect to brewing? Dan: My dad has definitely taught me plenty over the years. The NBCBA has been a huge part of my development as a brewer. The club has a massive amount of knowledge and brewing experience. Jake: 90% of my brewing knowledge is from the NBCBA. I do tend to spend a lot of time online doing research and reading about the profession. For both of us, most of the learning is obtained through brewing. There’s only so much you can learn through reading and discussion with your beer club buddies – the best way to learn is through experience. 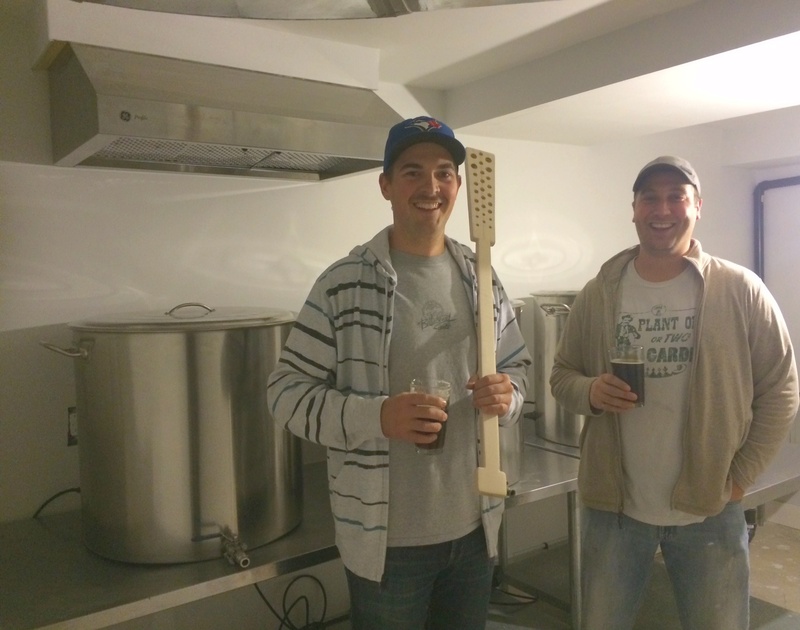 Welcome, TrailWay Brewing, to the growing list of Atlantic Canadian craft breweries! We look forward to trying their beers as they become available, and will continue to keep you updated on their progress. In the meantime, follow them on Twitter and Facebook for continued updates on brewery construction, licensure, and more!